This post explains how to use TextWrangler on a Mac to edit text files that live on a remote Amazon EC2 instance with Ubuntu. Now you're ready to use TextWrangler to connect to your server and browse files. 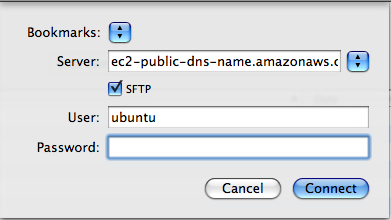 Choose: File -> Open from FTP/SFTP Server... Then enter your server publisher DNS name, check the SFTP box and enter ubuntu as the User name. You can leave the Password: field blank. After you hit connect, you TextWrangler will allow you to browse the file system of your EC2 instance, choose a file, and edit it. When you save the file, it will update directly on the remote EC2 instance. That's all there is to it!